Getting a good leg workout doesn't require a ton of free weights or expensive machines in a health club. In addition to running, which requires only a good pair of running shoes, time and commitment, men can do a wide range of exercises to build strong legs at home. 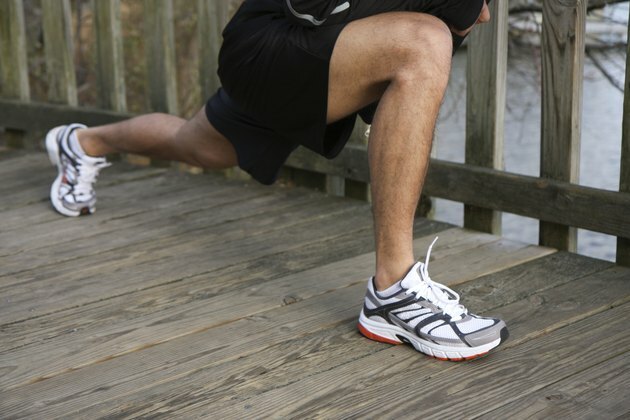 Maintain proper form and take your time with leg exercises to avoid strains and other injuries. Lunges are a little like push-ups in that they are relatively easy to do at home and work several muscle groups at one time. To start, take a long step forward with your right leg and, with your hands on your hips, lower your left leg until your knee forms a right angle. Then, using just your leg muscles, raise yourself back up and bring your right foot back. In an article on the website Bellevue Massage Therapy, licensed massage therapist Carol Wiley suggests three sets of 30 repetitions for each leg. Wiley recommends a smaller step forward if you have knee problems. To strengthen your calves, simply stand with your feel shoulder width apart and lift your heels up so you're on your tiptoes for a few seconds. Lower your heels and then repeat slowly and methodically. Wiley recommends three sets of 40 repetitions. And for an extra challenge, try heel raises on a step and let your heels extend below the edge of the step with each repetition. Calf muscles respond quickly to strength training, so if you like immediate results, heel raises are a must. There are many variations to the basic squat, an exercise aimed at strengthening the thigh muscles. To begin, start with your feet a little wider than your shoulders and hold the dumbbell vertically by one end. Then, with your back straight, bend your knees and let your elbows brush against the inside of your knees. To finish, rise up slowly and repeat so you eventually do three sets of 10 to 12 repetitions. Increase the level of difficulty by jumping on the upward phase of the exercise; land with your feet shoulder-width apart.